One of the two Vistaliners recently acquired by Unity Group is seen below at company headquarters in Airdrie, AB. The aircraft has been placed with Titan Air (Randolph Holdings) in Nassau. The company currently operates twin Cessna aircraft through the islands. The aircraft has been placed, with closure expected next month with a U.S. operator. It has undergone a 10 month upgrade at Regent Aircraft Services in Calgary prior to departure. The aircraft was acquired (minus wings) Apr-2019 by Gravitas Aviation Ltd., West Vancouver, BC. 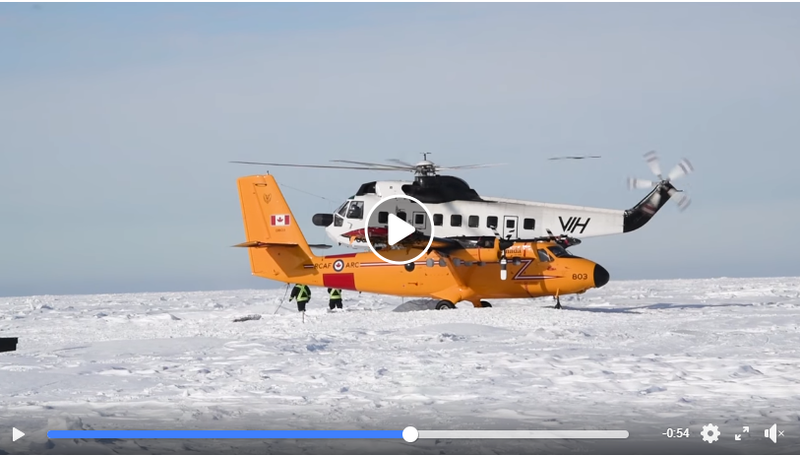 It had earlier been recovered from the ice near Deadhorse, AK following a take-off incident in Mar-2018. The aircraft, which has less than 30,000 hrs on the clock will be fully repaired and overhauled. Registration cancelled 24-Apr-2019 on export to China. This aircraft had been delivered via Ketchikan - Fairbanks - Anchorage - Nome - Anadyr on 09/13-Feb-2019. Registration cancelled 10-Apr-2019 on export to Canada. Sold to Unity Group Ltd., Airdrie, AB 10-Apr-2019 and officially imported to Canada 11-Apr-2019. It appears the aircraft was delivered from Boulder to Airdrie on 07-Apr-2019. IKHANA Aircraft Services, a DBA of IKHANA Group Inc., provides DESIGN - BUILD - FLY solutions to the aerospace industry through integration of new technologies, aircraft modifications, heavy maintenance, major repair, and critical parts manufacturing. Headquartered at the French Valley Airport (F70) in Murrieta, California, IKHANA holds FAA, EASA, Transport Canada, and Fiji repair station approvals, FAA Parts Manufacturer Approval (PMA), and is a Viking Air Factory Endorsed Service Center. IKHANA has a proven reputation for developing unique engineered solutions across a wide variety of aircraft platforms and diverse customer base including extensive experience in the DHC-6 Twin Otter, King Air, and Gulfstream airframes. Flyme (Villa Air) has announced that it too will join Trans Maldivian, Maldivian Seaplane and Manta Air as a Twin Otter operator later this year. The company is acquiring four DHC-6-300’s for delivery beginning in October of this year. The aircraft will operate from Male’s new seaplane terminal, scheduled to open in August. Currently Flyme operates ATR-42 and ATR-72 aircraft. “The unique part about this new program is the use of our own proprietary, highly engineered parts that offer customers zero lead times, superior quality, latest technology and outstanding reliability. An example of this would be our FEx3 plated piston tube in comparison to the standard chrome, which was developed in the 60’s. FEx3 piston tubes have a proven track record of in-service reliability for the past 8 years”, said Andy Sanfilippo, CEO of Team JAS. Updating previous entry; flew Springbank, AB - Fort St. John, BC - Watson Lake, YT - Whitehorse, YT - Fairbanks, AK - Deadhorse, AK 02/03-Feb-2019 for lease to ConocoPhillips Alaska. In service 08-Feb-2019 Deadhorse, AK - Alpine, AK. Flew Punta Arenas - Puerto Montt - Arica - Guayaquil - Roatan - Dallas-Addison, TX - Gillette, WY - Calgary-Int’l, AB 10/16-Feb-2019 returning from Antarctica. Flew via Panama City - Nassau - Wilmington, NC - Sault Ste. Marie, ON 25/26-Feb-2019 returning from Antarctica. Flew Punta Arenas - Concepcion - Arica - Guayaquil - Roatan - Dallas-Addison, TX - Gillette, WY - Calgary-Int’l, AB 22/27-Feb-2019 returning from Antarctica. Flew Roatan - Dallas-Addison, TX - Gillette, WY - Calgary-Int’l, AB 08/09-Feb-2019 returning from Antarctica. Updating previous entry; flew Corning, NY - Pekin, IL - Colorado Springs, CO 13/14-Feb-2019. Test flown from Springbank, AB 25-Feb-2019; still pending delivery to Manta Air in the Maldives. Officially imported to Canada 19-Feb-2019 and registered to Regent Aircraft Services Inc., Calgary, AB 05-Mar-2019 as C-GIQE. This aircraft was recovered in Nepal in Sep-2018 and shipped to Canada via container for rebuilding. Flew Punta Arenas - Araucania - Arica - Guayaquil - Roatan - Dallas-Addison, TX - Gillette, WY - Calgary-Int’l, AB 17/24-Feb-2019 returning from Antarctica. Flew Punta Arenas - Concepcion - Arica - Guayaquil - Roatan - Dallas-Addison, TX - Gillette, WY - Calgary-Int’l, AB 20/27-Feb-2019 returning from Antarctica. Flew via Concepcion 11-Feb-2019 and Roatan - Dallas-Addison, TX - Gillette, WY - Calgary-Int’l, AB 15/16-Feb-2019 returning from Antarctica. Flew Victoria-Int’l, BC - Ketchikan, AK - Fairbanks, AK 09-Feb-2019, Fairbanks, AK - Anchorage, AK 11-Feb-2019 and then Anchorage, AK - Nome, AK - Anadyr-Ugolny 12/13-Feb-2019. These updates have previously been reported in the prior blog entries below. This is just notification that the Aircraft History File has now been updated accordingly. Updates will resume effective this afternoon. Thanks for your patience! Another quiet day, so some images below that I will also add to the Aircraft History Pages tomorrow. As well, I have a photo contribution from Chile to add later this afternoon.